This entry was posted in Photo Gallery, Photography, Sharing photos and tagged attaching photos, digital pictures, Hotmail, photo email, photography, photos, sharing photos, Windows Live Mail, Windows Live Photo Gallery by Ludwig. Bookmark the permalink. 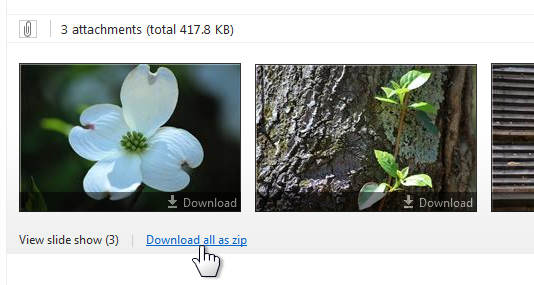 How can I download photos from the gallary to facebook? For uploading pictures to Facebook, in Live Photo Gallery select the photos and click on the Facebook icon in the Share group on the Home ribbon. If you have not used this before there will be a series of dialogs to assist you in connecting to Facebook. You can add your pictures to any of your Facebook albums or create a new one. 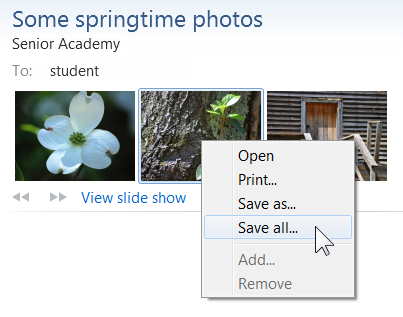 For posting a link in Facebook for a SkyDrive photo or album, see me post How do I share a SkyDrive photo on Facebook? Can I send a photo email from a different email program besides Live Mail? Can I make Photo Gallery “Create a photo email with Microsoft Outlook” instead of with “Live Mail”? Is there a way to change the setting of which email program is opened to send the photo email or does this feature only work with Live Mail? Thank you Josh for your comments. The photo email feature is only available in the Live Mail desktop email client. You can send similar photo emails, but without the neat arrangement options, from your SkyDrive (which uses your Hotmail or now Outlook online mail). 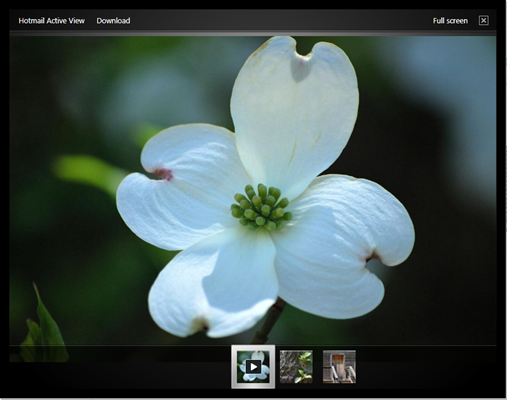 Photo Gallery uses whichever mail client is set up as the default on your PC. If Outlook (the one that comes in Microsoft Office and is installed on your PC), or some other mail client, is the default mail client, then the photos will just be attached, not sent as photo emails with the photos stored on your SkyDrive. If this still leaves you with questions, please use the “send message” option to get in touch with me – I will try to help. That is helpful, thank you. 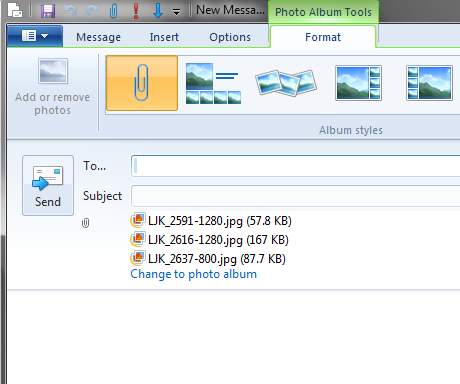 My solution will be to keep Windows Live mail for sending the photo emails, but still use Outlook for other things. Is there any way to ALWAYS “send photos as attachments”? 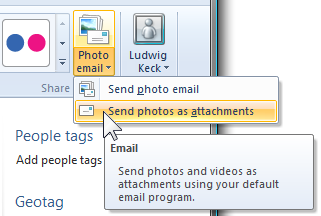 Or set the default for “Photo email” to be “send as attachments” rather than “send photo email”? It seems the “send photo email” requires you to use a hotmail email account. My mother-in-law always selects the “send photo email” option under “Photo email” and it clogs up her Windows Live Mail outbox. Help, please! 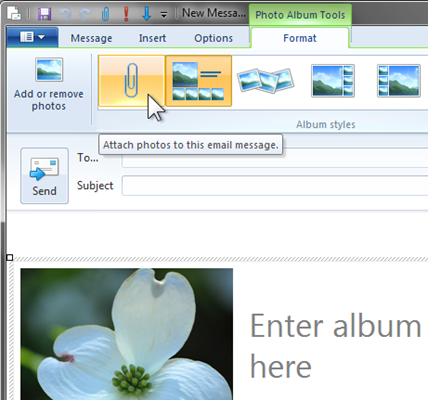 With Windows Live Mail as your default mail client, Photo Gallery will use “Photo email” as the default. Photo email uploads the photos to SkyDrive (using the default Microsoft account) and only thumbnails are included in the email, so there is no clogging of the outbox or the recipients inbox. Maybe I do not understand the problem. Can you provide more information? Thanks for the reply. I don’t want to use SkyDrive or a Microsoft account. I want Photo Gallery to always use “send as attachments” as the default. But I’m not sure how to set that as the default. My mother-in-law has a hard time clicking on the little triangle in the bottom right of the button. Afraid I don’t know of a way to change the default. 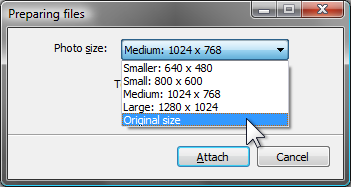 There is a process in Windows Live Mail to change to “attach” from “photo email”: Click the thumbnail area, click the “Photo Albums Tools” tab, click the now fairly large paperclip icon. The photos are now attached. The only other way to avoid photo email that I am aware of is to replace Windows Live Mail with Outlook (or another) as the default mail client – then Photo Gallery does not offer Photo email at all – photos will be attached. 2. It also says under the pictures: “View Slide Show” so he can increase/decrease size, etc. 3. Could I have the step by step instructions please? I tried and tried and all I get is the Album displayed which is not clickable at all. You and the rest of us are all confused. Microsoft is clearly out of control. Maybe it all will settle down. Keep your fingers crossed. Right now just don’t try using photo emails. Hurray! The photo email that was hanging in the outmail folder has cleared after updating to Windows 10 Build 10166. Sending a new one went through without any problem. I have not checked to see if normal operation has been restored everywhere. With the flurry of rapid changes and problems I did not feel that a step by step set of instructions would be useful, indeed may not even work, by the time they are published. There will, no doubt, be additional changes before Windows and their tools settle down. I will then review various instructions and publish new articles. In the meantime the instructions in this post for sending photos as attachments work as described. On the recipients end there are some differences, but none that could not be readability understood. Please send me a private message (upper right corner) and I will help you through these difficult times. Please see this answer: How do I download emailed pictures?